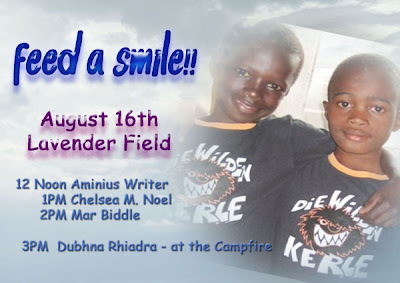 I hope you'll join us as Aminius, Chelsea, Mar Biddle and Dubhna take the stage to raise some funds for very real meals for very, very real and poor children on the Live and Learn in Kenya Int'l program. I'm sure you've heard these fabulous musicians already - and if not - well, it's about time folks. ...and if that isn't enough of extra special musicians - well then take a look at Friday's event. 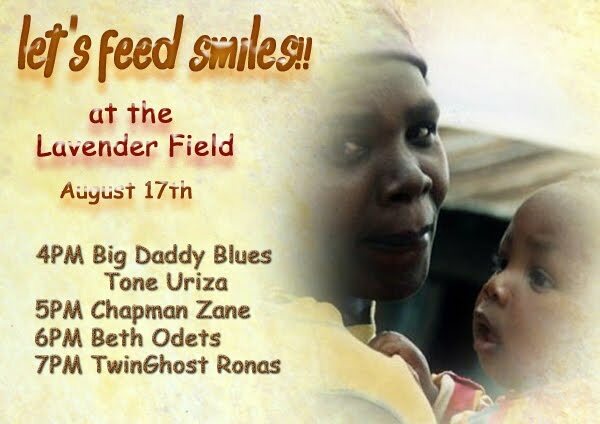 Starting at 4PM with Big Daddy Blues - Tone Uriza - who will knock you off your feet with his awesome set - then - Chapman Zane - careful guys, hold your ladies tight ;) - then the beauties of the fiddle and vocals from Beth Odets and to top it all off with whipped cream and cherry - TwinGhost Ronas! Oh - don't miss it! I hope to see you at the Lavender Field today.